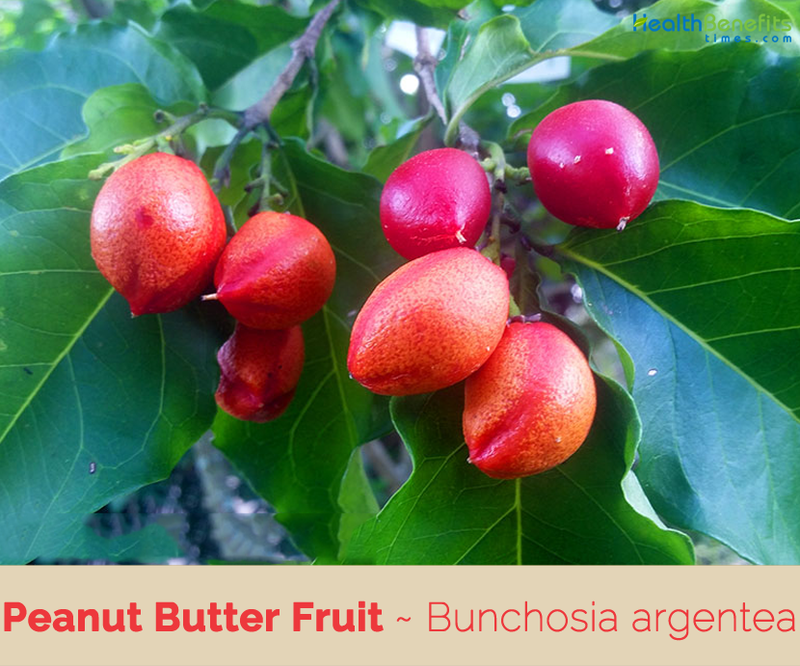 Peanut Butter fruit, botanically known as Bunchosia argentea or Bunchosia armeniaca, is a tropical fruit tree which is a member of the Malpighiaceae family. 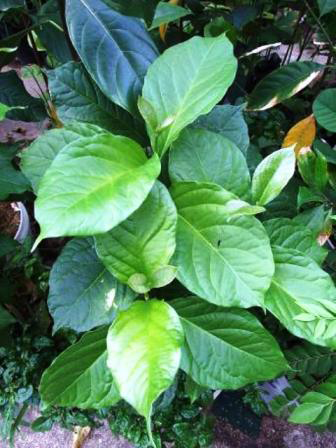 The plant is native to the northwestern South America (Colombia, Ecuador, Bolivia, Venezuela, Brazil and Peru). 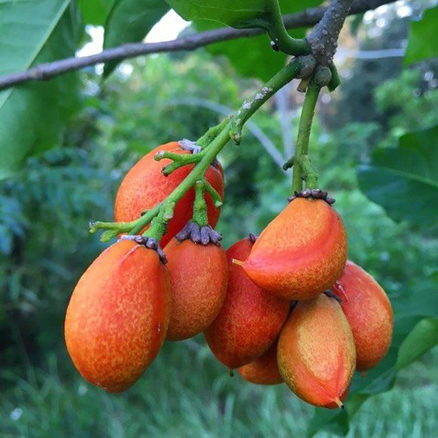 Also known as Bunchosia fruit tree, it is the plant that is grown as an ornamental for its vibrant yellow blooms and red fruit which it produces simultaneously. 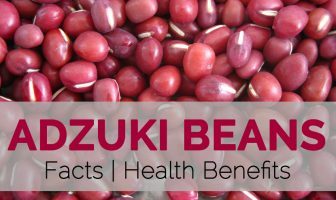 Some of the popular common names of the plants are Bunchosia, Green Plum, Monk’s Plum, Peanut Butter Fruit and Peanut Butter Tree. 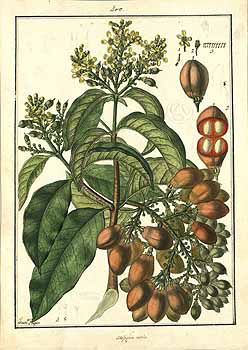 The name Bunchosia is said to come from an Arabic word, bunchos, meaning coffee, for the resemblance of the seed-containing pyrenes of the fruit to the mericarps of Coffea Arabica. The name of the species refers to the shape and color of the fruits, similar to those of the apricots. 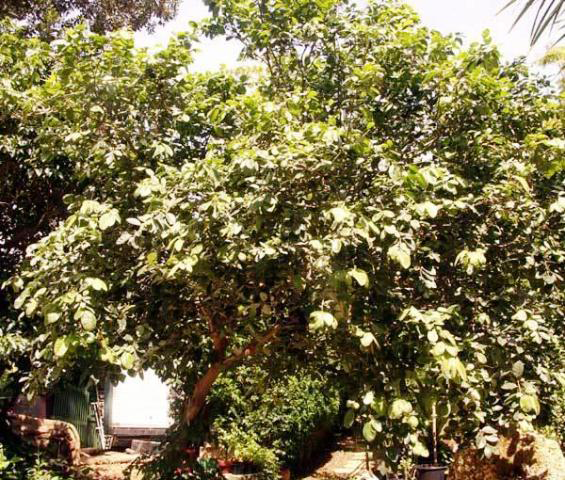 The tree is also grown for its edible fruit however it has never experienced commercial success due to the delicate and perishable nature of the fruit. Some people have linked the fruit to a cooked sweet potato, whilst it is also called the peanut butter fruit because of its texture, but not its taste, that is similar to peanut butter. 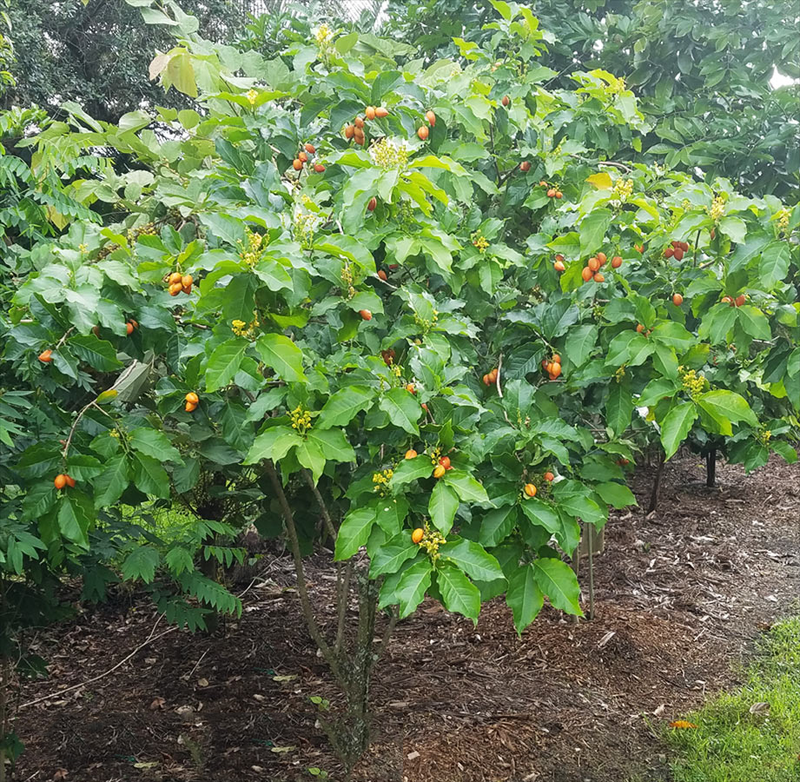 Peanut butter fruit is a small, highly ornamental and hardy tropical, evergreen perennial tree or shrub that grows about 2–4 m (6–13 ft.) tall. 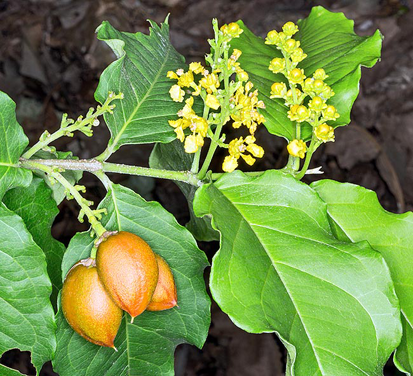 The plant is found growing in dry and moist limestone forests near the coast, dry rocky open lowland and normally prefers moist, fertile loamy soil rich in organic matter. Remember try to stay away from wet, mucky soils. Stems are persistently sericeous, the older woody stems are glabrate. The tree has stiff, spreading branches. Short petiolate leaves are simple, opposite, lanceolate to ovate, chartaceous, 10-27 cm long and 5-10 cm wide, rounded to wedge-shaped, marginally striped, spiky, sparsely scaly on both sides, later glabrous, 6-7 lateral veins. 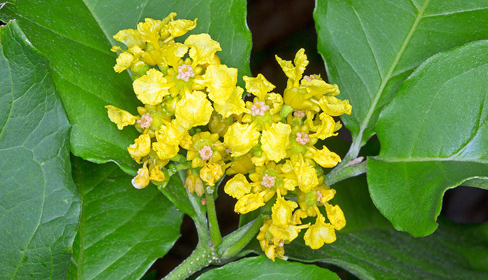 Compact axillary racemose inflorescences, 8-15 cm long, carrying numerous yellow hermaphrodite flowers, on a 0.5-1 cm long pedicel provided with glandular tubercles, about 1.5 cm in diameter, with penta partid calyx, 5 unguillated petals (Petals with a long narrow base similar to a stem), 5-6 mm long, with an oval laminate and fringed-serrated margin, and 10 Monadelfian stamens (stamens with fused filaments and free anthers). Fruits are borne in clusters. They are an indehiscent, 2.5 cm long, ovoid, ellipsoid to obovate berry with thin pale green skin turning to orange then red at maturity. 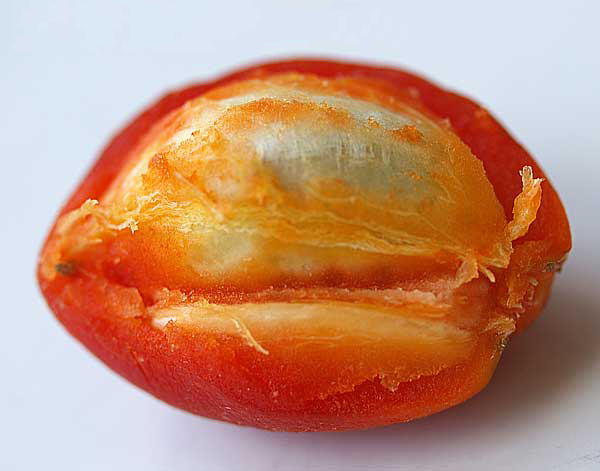 The internal pulp of the Peanut Butter fruit is very thick and slightly sticky similar to that of soft persimmon and surrounds a large central seed. The fruit offers an aroma reminiscent of peanut butter and a sweet flavor which has been compared to that of sweet potato and dried fig. Once ripe, Peanut Butter fruits must be harvested immediately to prevent them from spoiling on the tree. Due to the delicate nature of the fruit, they are not suitable for shipping. The fruit is mostly eaten fresh, also used for jellies, jams, or preserves. The peanut butter plant will go through several blooming cycles from March until October; the fruiting season is summer to fall. 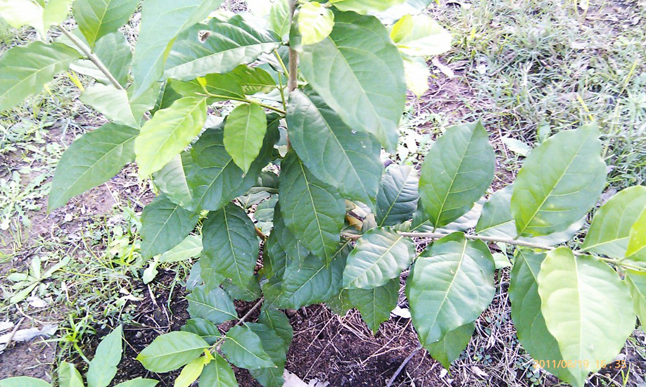 The tree is native to Northern and Western South America: Venezuela and Columbia. Naturalized In Southern America: Caribbean (Grenada, Guadeloupe, Martinique, Montserrat, Puerto Rico), Northern and Western South America: Guayana, Suriname, Bolivia, Ecuador, Peru and Brazil. It also has been introduced to elsewhere in the tropics. 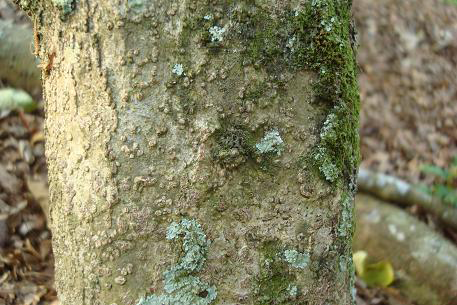 The tree requires a tropical climate with or without a dry season. It is rarely cultivated outside its natural range except in botanical gardens or as a curiosity. Eating peanut butter mainly help in reducing the problems of heart as it reduces the cholesterol levels which is the main reason behind which heart ailments. Not only it solves heart problems but also makes our nerves function effectively. Ripe fruit is mostly eaten fresh. It is also used for jellies, jams, muffins, or preserves and to flavor drinks and milk shakes. 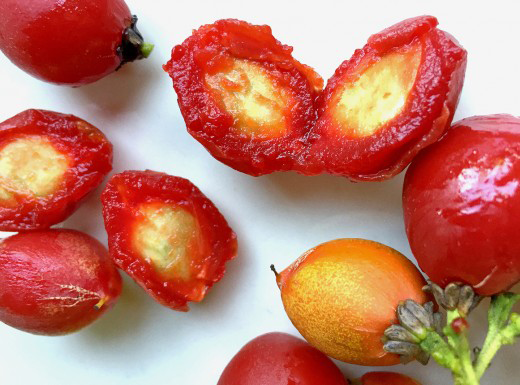 The fruit can be refrigerated and the pulp can be frozen. 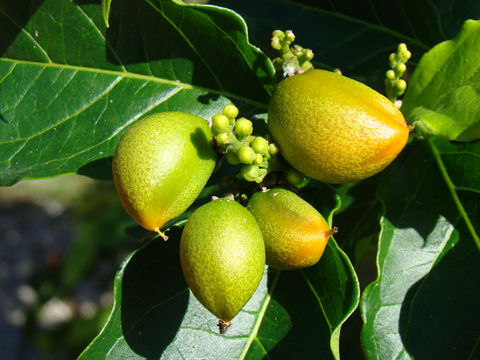 The tree is mainly cultivated as a fruit tree and as an ornamental tree in gardens.